When a recipe calls for the least variety of ingredients, for one it must be really easy to make and for two it has to be simply delicious. 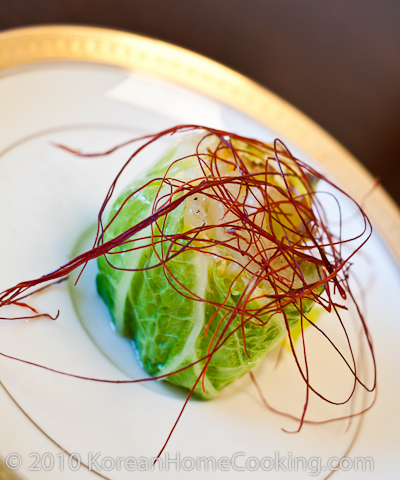 When I first saw this recipe in the Nobu cookbook , I had a doubt how good a cabbage can be. 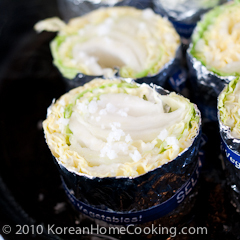 Since I had all the ingredients - napa cabbage and coarse sea salt - at hand, I gave a try. To my pleasant surprise, this was incredibly juicy and sweet. 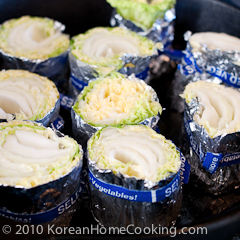 As Chef Nobu says in his book, the key to this recipe is to wrap the cabbage leaves as tightly as you can so that the steam is trapped and 100% cabbage juice fills your mouth. 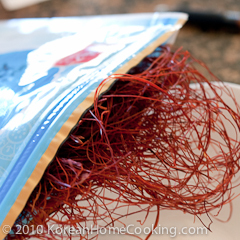 I really admire Nobu for creating such a simple recipe but whose taste is long remembered. 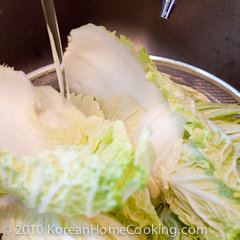 Separate the cabbage leaves, rinse them with water and pat dry. 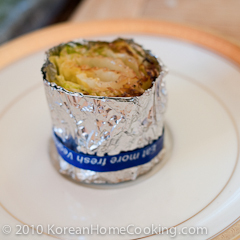 On a sheet of aluminum foil, arrange the cabbage leaves on top of one another. 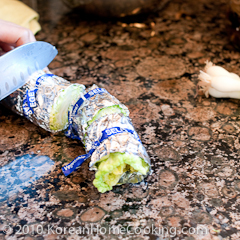 Roll the foil as tightly as you can, and fasten the roll with vegetable wires. Cut the roll into approximately 2" tall. Grease a pan with enough oil and pan fry the rolls over medium heat. Scatter rock salt over the cabbage rolls. Turn upside down when one side turns brown. 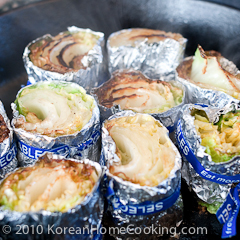 Once they are cooked on both sides, move to the plate and remove the foil. 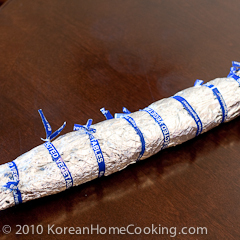 Top it with thin slices of dry pepper or other garnish. i know this is sooo...irrelevant with ur post. but seriously i want to know how must i keep my instant tteokbokki??? i buy it while was vacationing there last may. i just put it in the freezer.. is it ok? i finish the other packet...now 1 got only 1 left...so the best way keeping it??? 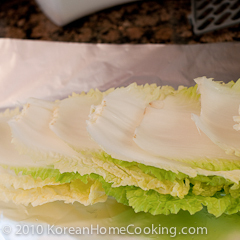 I am not a big fan of cabbage, to be honest, but this recipe looks delicious. I think I am going to take a risk and try this one tomorrow. So far, recipes from your blog turn out to be great when I cook. Thanks a lot for sharing.